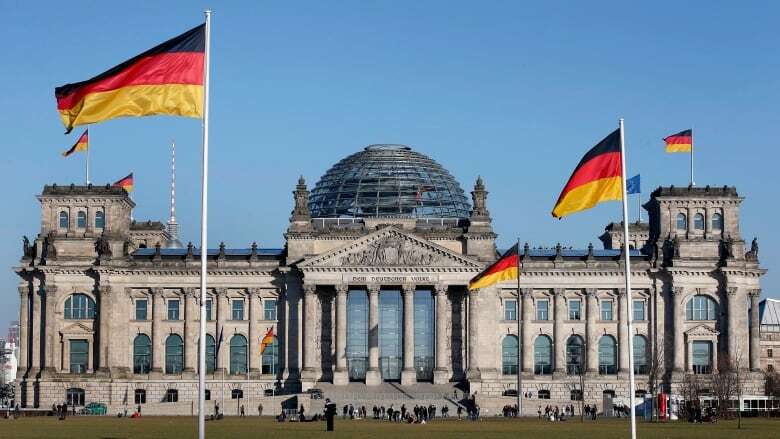 Germany recorded zero growth in the fourth quarter, narrowly avoiding a recession and adding to downbeat signs piling up about the 19-country eurozone economy. The lacklustre figure released Thursday by the state statistics agency followed a 0.2 per cent fall in output during the preceding third quarter. Business spending on machinery and equipment as well as construction supported the economy in the fourth quarter and kept Germany from suffering two straight quarters of negative growth, one definition of a recession. Exports and imports increased at nearly the same rate, meaning no positive contribution to fourth-quarter growth statistics. Slowing global trade amid U.S.-China trade tensions has been holding back Germany's export-focused economy. Growth last year was also hit by troubles in the auto industry when automakers had difficulty getting new cars certified under new emissions tests, and by low water on the Rhine River that interrupted commerce. The slowdown led the European Commission last week to cut its growth forecast for Germany for this year to 1.1 per cent from 1.8 per cent. The weak second half followed stronger performance in the first six months, leaving growth for all of 2018 at 1.5 per cent. For the fourth quarter, the year-on-year growth rate slumped to 0.6 per cent, tracing a steady decline from 1.2 per cent year on year in the third quarter and 2.0 per cent in the second. Germany's recent economic sluggishness has held back growth in other countries that use the euro. On top of that, Italy entered a recession at the end of the year and European businesses face uncertainty about Britain's possible exit from the European Union on March 29 without a negotiated agreement to smooth trade. The eurozone grew by just 0.2 per cent in the fourth quarter, the same as in the previous three-month period. Recent economic indicators have been weak, leading to speculation that the European Central Bank may hold off raising interest rates longer than originally expected. The bank has said it will hold rates at record lows at least until "through the summer" of this year. Analysts say it may push back that earliest possible date in its policy statement if signs of weakness continue. Andrew Kenningham, chief Europe economist at Capital Economics, said the fourth-quarter weakness "bodes ill for economic growth this year too." He said the fourth-quarter weakness could no longer be attributed to the auto sector problems since vehicle production edged up in the last three months of the year. He forecast 1 per cent growth this year but added "there are significant downside risks to this forecast." Economist Carsten Brzeski at ING Germany said "the German economy escaped a technical recession with the smallest margin possible. The black eye just got blacker." He said, however, that many economic fundamentals remain strong. A low unemployment rate of 3.3 per cent is helping support domestic demand. "The upside from today's data is that it can hardly get worse," Brzeski said. "Economic fundamentals remain solid and from here on, chances of a gradual rebound are still much higher than chances of yet another disappointment."